Much of the magic of the bones is in the grip. The middle finger presses the bone closest to your thumb tightly into the lifeline of your palm. The other bone is held fairly loosely with the ring finger. Bend your wrist back slightly, and keep it supple and fluid. Want more grip help? To play a single tap, briskly move your hand to the side and down. Hold the cursor over the animation to the left to see what the motion looks like (it may take a while to load), or click on the text to see a slow-motion animation. 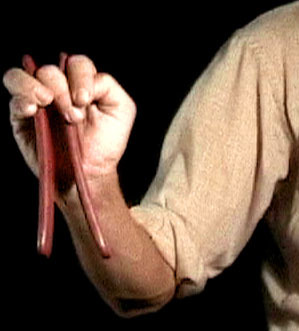 Keep the grip fixed and "whip" your hand away from you and back. If you're not getting it, I have more tap help. To play three rapid clicks with one movement, see the animation to the left. Start like a tap, but then allow your hand to continue towards your body, giving a little "whip" at the top just like you do at the bottom for a single tap. Look here for more triplet help. Many patterns can be played with just single taps and triplets. I'll be adding more techniques and pattern suggestions to this page occasionally.